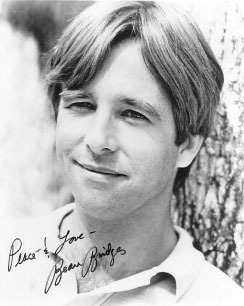 Lloyd Bridges III is the older brother of moviestar Jeff Bridges, and son of TV star Lloyd Bridges. The nickname "Beau" stuck to Bridges from an early age, and was originally based on his resemblance to the young actor who played Leslie Howard's son in Gone with the Wind. He made his film debut at the age of seven in No Minor Vices with Dana Andrews, and had his first major role the next year, in The Red Pony with Robert Mitchum and Myrna Loy. In adolescence, he stopped acting, and in high school he lettered in basketball. He was good enough to play college ball for John Wooden's UCLA Bruins, but he wanted more playing time so he transferred to the University of Hawaii. There, he again sat on the bench, and quickly dropped out. He tried making music with his brother, and in 1969 they were signed to a recording contract by Quincy Jones, but nothing noteworthy ever came from that partnership. At 19, Bridges co-starred in The Clear Horizon, a weekday science fiction serial with Ted Knight and Lee Meriwether. When that show was cancelled, he jumped to prime time, playing Seaman Howard Spicer on the sitcom Ensign O'Toole with Dean Jones and Jack Albertson. He also appeared on several episodes of his father's Sea Hunt, and made occasional appearances on My Three Sons with Fred MacMurray, Ben Casey with Vince Edwards, and Mr. Novak with James Franciscus. He has been both leading man and supporting actor, with memorable roles in The Incident, a subway thriller co-starring Ruby Dee and Ed McMahon; The Landlord, a groundbreaking 1970 interracial romance with Diana Sands; Norma Rae, as Sally Field's husband; and The Fabulous Baker Boys, opposite his brother and Michelle Pfeiffer. On TV's The Agency, he replaced Ronny Cox as the Director of the CIA, and in assorted TV movies and miniseries he has played P. T. Barnum, Colonel Tom Parker, Richard M. Nixon, and White House Press Secretary James Brady. Hollywood Walk of Fame 7-Apr-2003, 7065 Hollywood Blvd.